Fix the Debt spokeswoman leaves the troubled group. 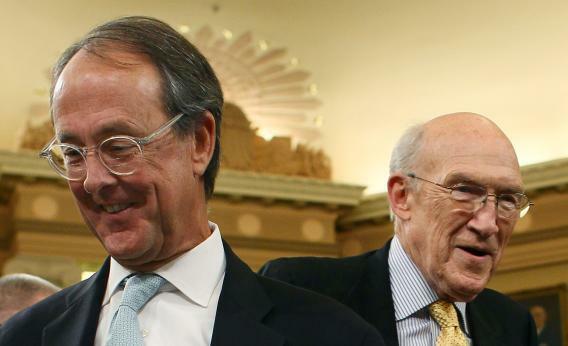 Co-chairmen of the National Commission on Fiscal Responsibility and Reform, former Sen. Alan Simpson, (R-WY)(R), and Erskine Bowles (L), participate in a Joint Deficit Reduction Committee hearing on Capitol Hill, on November 1, 2011 in Washington, DC. It comes from Politico’s “Influence” page. Get a handkerchief. STEVENS LEAVES FIX THE DEBT: Pam Stevens, national press secretary for Fix the Debt, has left the group to work for the GOP Conference Committee. Stevens previously worked in the White House under President George W. Bush. Fix the Debt, you might recall, is an umbrella group of business leaders and deficit scolds who, with $63 million to burn, spent 2012 Raising Awareness of the need for a long-term deficit deal—as long as it didn’t raise taxes. It pretended to support a “Simpson-Bowles style” deal and got Alan Simpson and Erskine Bowles onto yet more Sunday and morning shows, even though its principles were more regressive than theirs. And it’s still putting together things like “Common Ground summits,” as if it didn’t learn last year that bland awareness-raising without specific goals was completely useless. Its spokesman managed to figure this out eventually.